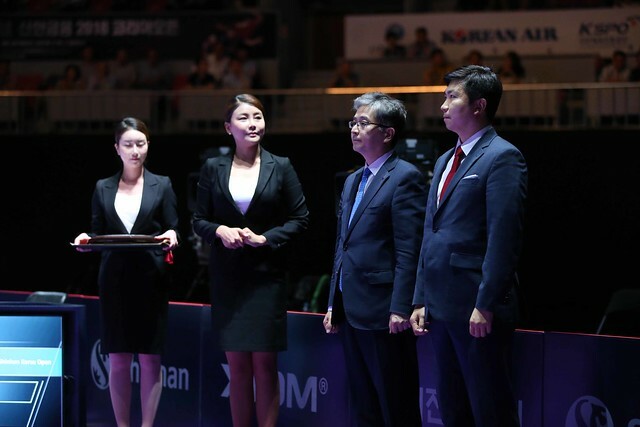 Occupying the fourth seeded spot, Cheng Meng and Ding Ning won the Women’s Doubles title at the Seamaster 2018 ITTF World Tour Platinum Shinhan Korea Open in Daejeon on the afternoon of Sunday 22nd July. After a somewhat tentative start, they beat colleagues Wang Manyu and Zhu Yuling, the third seeds, in a contest in which every game was decided by the minimal two point margin (14-12, 9-11, 11-9, 13-11). Both pairs having opportunities, both involved in discussions when preparing to serve, the points brief, serve and receive the vital factor, rallies minimum, Chen Meng and Ding Ning secured the opening game by the narrowest of margins. A close first game with neither pair able to assert authority and gain a telling lead, the second game was very much the same, the verdict went to Wang Manyu and Zhu Yuling who after trailing 8-9 captured the last three points to level matters. Three points in a row to secure the second game, Wang Manyu and Zhu Yuling continued in a winning vein to clinch the first three points on the third game. Chen Meng and Ding responded, they levelled matters at 5-all, before establishing a 9-6 lead and eventually winning the game by the minimal two point margin. Confident, positive, Chen Meng and Ding Ning established a three-nil lead in the fourth game; Wang Manyu and Zhu Yuling called “Time Out”; Chen Meng and Zhu Yuling reduced the deficit to one point at 5-4 in arrears, now Chen Meng and Ding Ning called for the one minute break. The pause worked but not for Chen Meng and Ding Ning, it worked for Wang Manyu and Zhu Yuling; they won the next four points before Chen Meng and Ding Ning levelled at 9-all, eventually securing the title on their second match point. It was for Ding Ning her 19th ITTF World Tour Women’s Doubles title, for Chen Meng her ninth but the first as a partnership; equally as a pairing it was a first final for Wang Manyu and Zhu Yuling.